The Dorset cottage where Thomas Hardy was born and where he wrote Far From the Madding Crowd. Also available as a giclee print. The birthplace, in Lower Bockhampton, Dorset, of the quintessentially English novelist and poet Thomas Hardy. The country cottage where he wrote Under the Greenwood Tree and Far From the Madding Crowd. 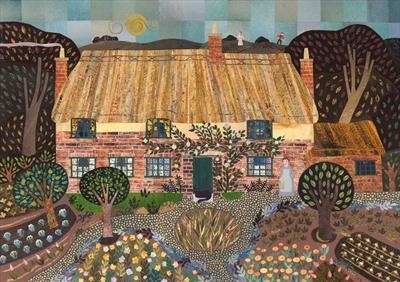 A cut paper collage by Amanda White, an artist creating naïve style images of writers' houses and imaginary doll-like portraits with an emphasis on detail and surface pattern. Recycling old magazines and flyers.